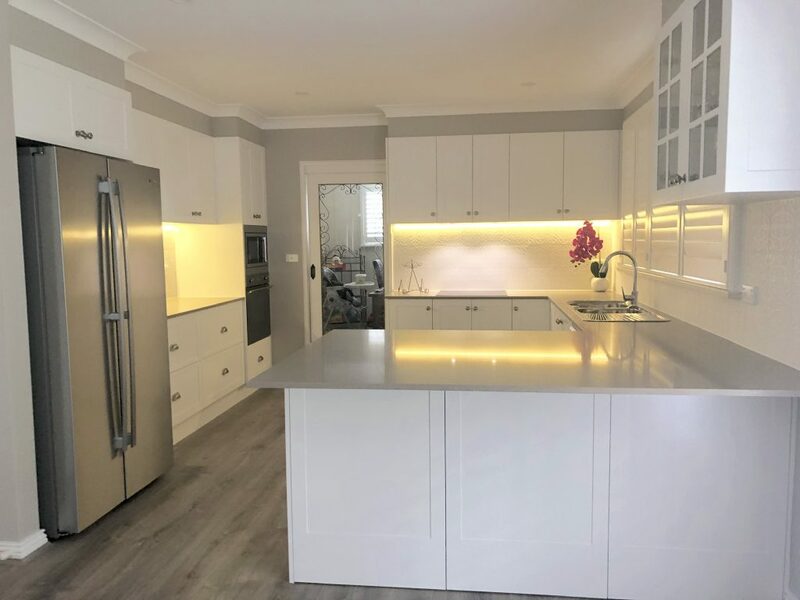 This kitchen and laundry renovation project we completed in Westleigh uses a white and neutral colour palette that creates an open and spacious feeling in both rooms. Storage space is in abundance in both the laundry and kitchen, utilising the cabinet layout to take advantage of as much wall space as possible. 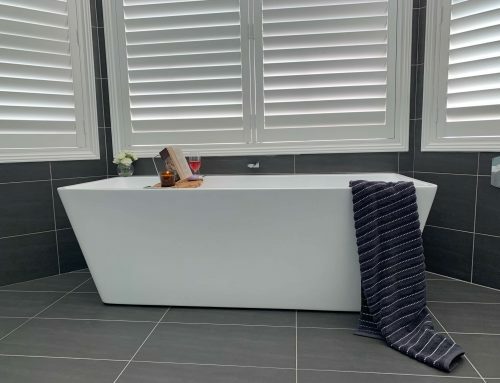 The wall cabinets are finished with a bulkhead to create a sleek and sophisticated finish and avoids dust collected on the top of the cupboards. 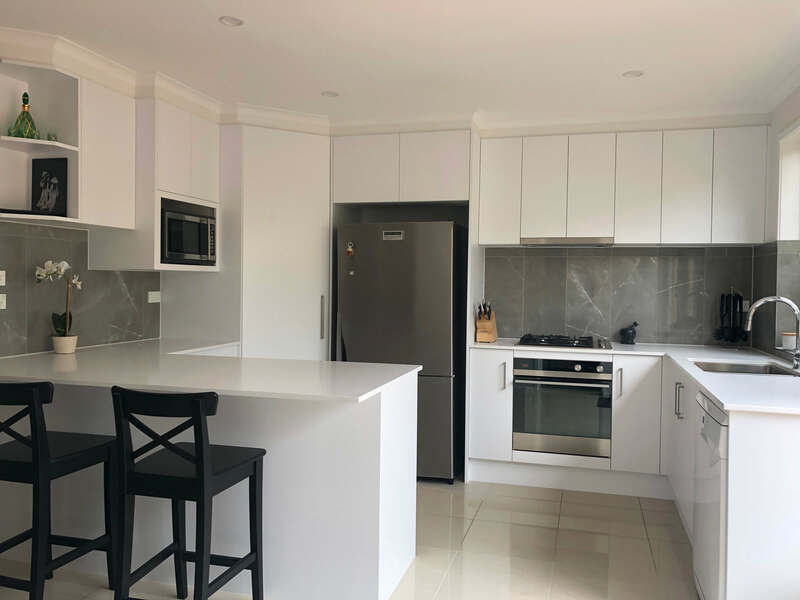 G shaped kitchen with an abundance of storage and benchtop space with peninsula cabinet for informal dining – kitchen renovation by Master Bathrooms & Kitchens. The kitchen uses the popular G shape layout, which maximises storage and bench space. This layout also offers plenty of room for multiple people in the kitchen at the same time. The peninsula cabinet return also features cabinets on both sides for extra storage, and with the addition of a couple of bar stools, becomes a breakfast bar or place for guests to sit while entertaining. White shaker cabinets and drawers are complimented with brushed metal knobs and cup handles that blend in perfectly with the stainless steel appliances. 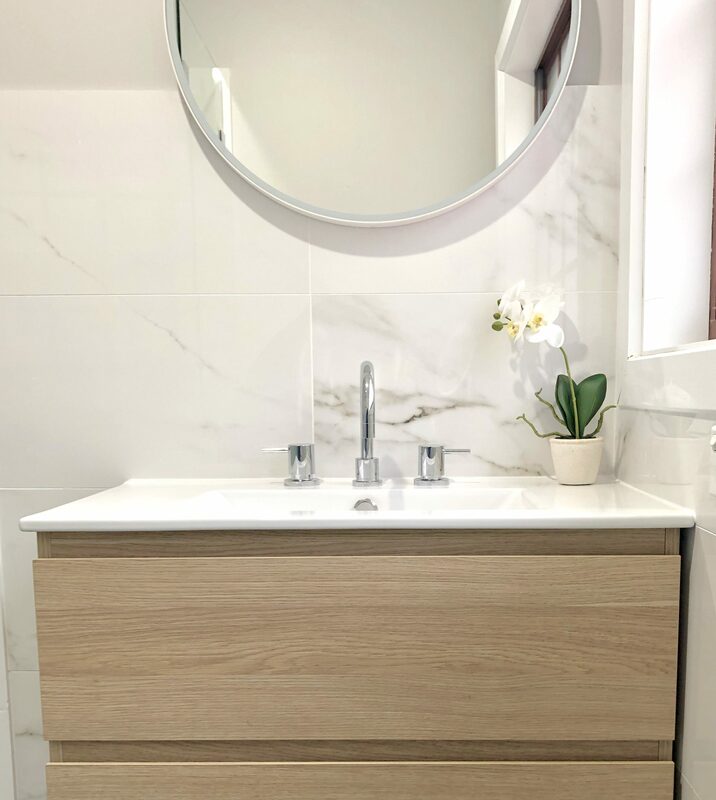 Caesarstone benchtops contrasts nicely with the white cabinets and blends well with the neutral colour wall paint and gorgeous timber floors. 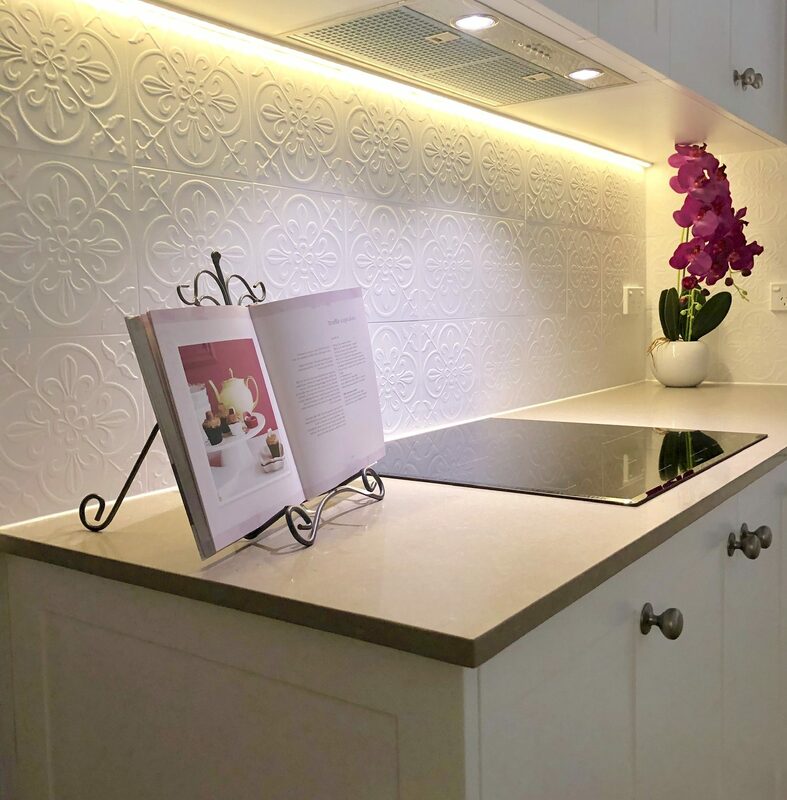 Under cabinet lighting accentuates the gorgeous hand made tiles on kitchen splashback with engineered stone – kitchen renovation by Master Bathrooms & Kitchens. 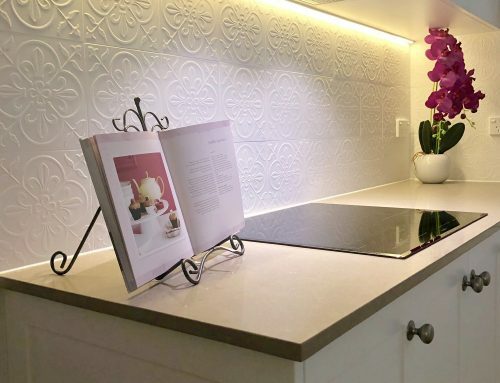 Beautiful white hand made tiles with a traditional textured design were used for the kitchen splashback, which creates a stunning feature in this kitchen. Under cabinet lighting highlights these hand made tiles perfectly in the evening. Another fantastic feature of this kitchen is the farmhouse door we installed that separates the kitchen and laundry which not only serves a practical purpose but adds character to both these rooms. 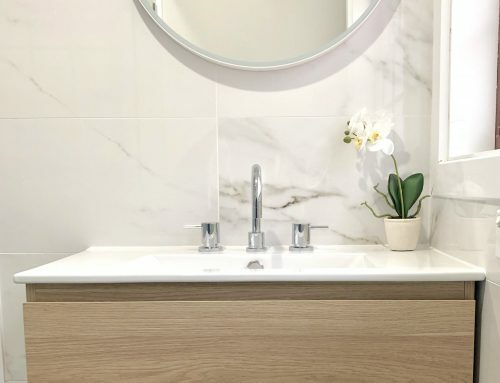 Beautiful white cabinets with engineered stone benchtop – laundry renovation by Master Bathrooms & Kitchens. 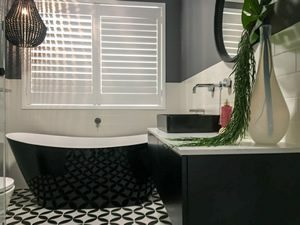 The laundry follows a single wall layout with both base and wall cabinets which are finished with a bulkhead for a continuous, sleek finish. 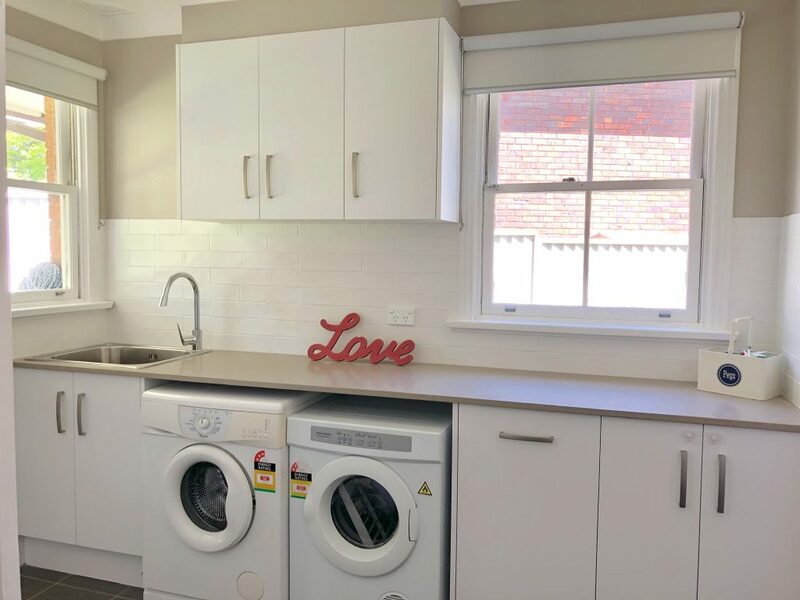 There is ample storage and benchtop workspace in this laundry ensuring a place for everything. The cabinets doors in the laundry, are a white flat panel design. 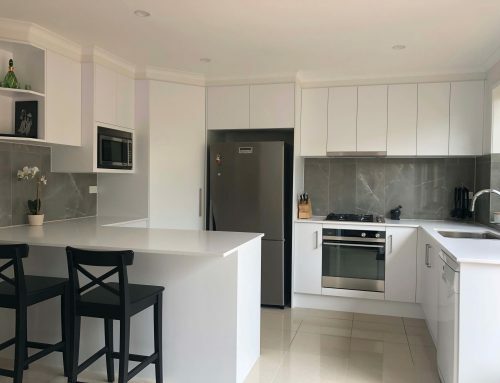 A white subway tile was used for the laundry splashback and the benchtop is the same as the kitchen to create a continuous and harmonious feel between the two rooms. A large deep drawer contains a large basket for dirty laundry, keeping it out of sight. Front loading washing machine and dryer sit side by side neatly under the benchtop. The chrome handles match the chrome arc style laundry tap and mixer. 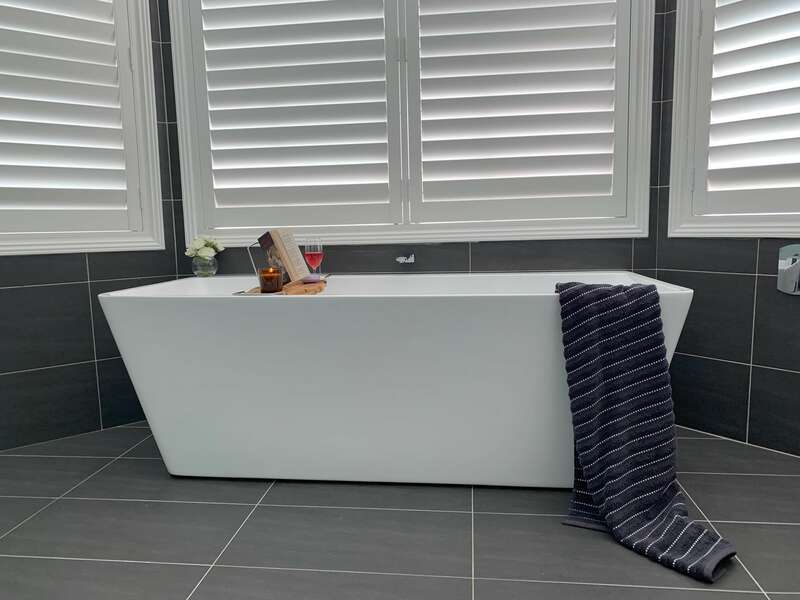 The floor tiles are a dark neutral 300 x 300mm porcelain tile. 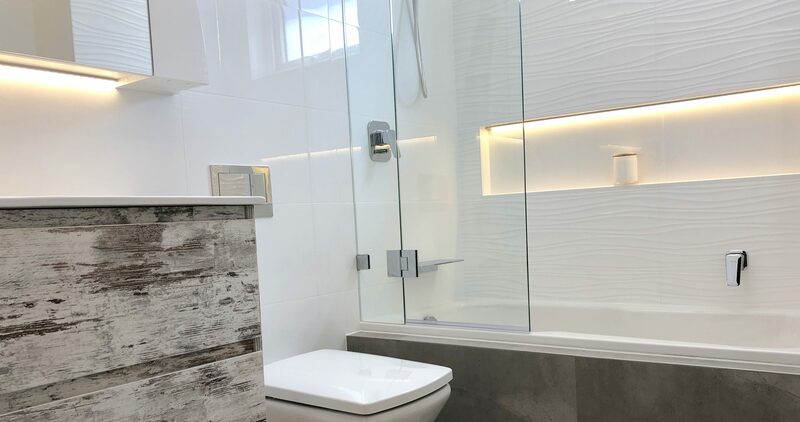 Master Bathrooms & Kitchens is a bathroom and kitchen renovation company that has been servicing the Hills District & Hornsby Shire for over 24 years. 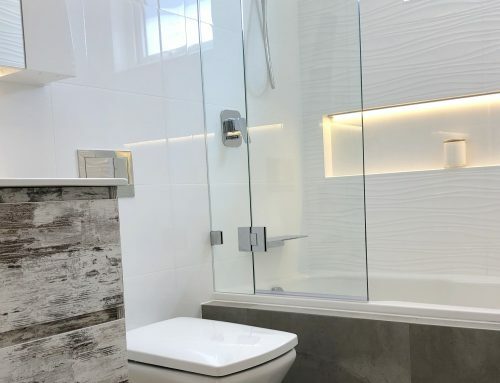 Peruse our website for more renovation inspiration and advice or simply call us on (02)9899-9330 to discuss your renovation and organise an in home quotation.